Ginkgo-Max Memory Booster Formula promotes good circulation and general well-being. It is a safe and effective herb used to sharpen memory and concentration, and is a valuable herb to support the brain and nervous system and helps to strengthen the capilleries and arterial system. 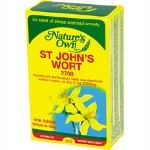 St Johns Wort has been demonstrated to have beneficial effects on disturbed sleep patterns, to alleviate anxiety and to promote calm. It has also been demonstrated to help treat mild to moderate depression.